I grew up in Palo Alto, CA. Palo Alto is an idyllic suburban town just 30 miles from San Francisco, part of the hotbed of technology called Silicon Valley. Filled with incredibly smart and interesting people, it is also home to one of the country's best and most beautiful universities: Leland Stanford University. When I was growing up there, in the late 70's and 80's, it was more relaxed than it is now. It had more of a professorville feel to it, with trickle-down hippiness from Berkeley, and elbow-patched, blazer-wearing intellectuals living in modest homes on tree-lined streets. Palo Alto is fancier now. The Varsity Theater is now a Borders Bookstore. Stanford Shopping Center no longer has a Woolworths or any fleeting sign of stores of that ilk. And places like The Co-op have disappeared, to be replaced with Longs Drugs on site, and Whole Foods in spirit. I don't long for the old days, I'm simply explaining the change. It used to be about station wagons, Big Wheels, and changing the world. Now it's about SUVs, stock portfolios, and landscaping. At least The Prolific Oven is still there. As I kid, I loved going to the supermarket with my parents. When The Co-op was still open, we went there most often. I thought it was cool because you had to be a member to shop there. It was like a secret food club. I have the worst memory in the world, but I can still remember how it looked, every inch of it. The pristine, symmetrical piles of produce. The artisan breads in baskets at the end of the aisles. The international foods aisle. That was my favorite aisle to walk down. The variety of different packaging was a sight to behold. Shiny tins. Odd shaped boxes. Slim sacks. All containing new and exciting foods I'd never tasted. One day I discovered the Asian candies. What weird flavors! Red bean? Lychee? Salty plum? I was seduced by their funny boxes and foreign imagery. But none kept me coming back for more like the Botan Rice Candy. The label says it has orange and lemon flavors, but I think they taste like something entirely their own. I loved the soft, chewy texture and the sweet pink flavor. Before the overparenting lawsuit craze, they also had toys inside, like tiny plastic cars or dolls. Now they have fake tattoos and stickers. But I admit, I liked the fake tattoos the best. I still like them. 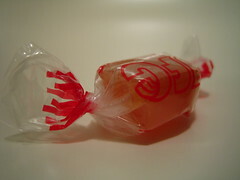 Oh, but the very very best part of the Botan Rice Candy was the inside wrapper. 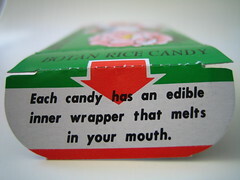 As the box says, each candy has an edible inner wrapper that melts in your mouth. With considerable effort, you can peel the edible rice paper from the candy and let it disappear on your tongue. At first it feels like a coating, and then it dissolves completely. If you leave it on the candy, you simply chew right through it. I don't know why they added the rice paper, but I love that they did. It's a tiny little detail that makes the Botan Rice Candy experience special. After I discovered the rice candy, I would go through the elaborate begging ritual every time we shopped there. Can I puhleeeeeese have some? Puhleeese? I promise I'll be quiet and good the whole time. I promise. Yes I'll wait until we leave before I eat the candies. I will. It usually didn't take too much convincing to get my parents to buy me one box of candies. Not like the monumental effort it took to get them to buy fake American cheese slices, or as my dad calls them: American Cheese Food. What they feed cheese. No, the Botan Rice Candy became a ritual at The Co-op. Along with a deep appreciation for excellent, fresh produce, specialty bread, and home cooking. It was a pretty nice way to grow up, if I do say so myself. 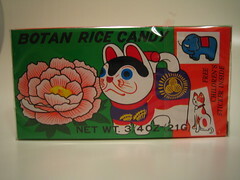 The Co-op and Botan Rice Candy are two of my favorite memories of hanging out with my grandma in Berkeley when I was a kid--thanks for the great post! Café Bizou. No thank you. Chumus, Hummus, or however you spell it.